One year ago today was my first day out of the workforce. I teared up on my last day; depressed that I wouldn’t be working at the bank anymore. That I wouldn’t get that promotion, my own office someday, the salary I dreamed of… but also ecstatic about the big plans that I had for my newly found free time. I would have time to keep my house clean! To cook actual meals! Have Romi’s snack ready when she gets home from school! Help out in her classroom! Do Random Acts of Kindness every day! Have polished nails! Play my keyboard and work on my DJ skills. Start that blog? Maybe even write a book that Hollywood makes a movie out of, starring me as myself (big dreams, remember?). But I would start by giving myself a break and taking my first day off, well, off. I had plenty of time to get to all that stuff later. As you might have guessed, most of that doesn’t happen. There are some things I failed to consider, like the fact that I was pregnant, and I am not a productive pregnant person. Throughout both pregnancies, I was nauseous the entiiiiire time. 24/7, for nine months. I threw up at work more times than I want to admit. Getting off the couch or concentrating on anything only made it worse, so I tended not to. Another problem was that being pregnant makes everything harder physically. I would imagine this is true for everyone. It was already hard for me to stand up and walk and balance. An extra 30 pounds hanging off my middle wasn’t helping. So I decided my big plans would wait until my pregnancy was over. Well, the thing about pregnancy is that when it’s over, you have a newborn. My house is still a mess, and it still seems like I don’t have time to clean it. I blame most of that on that fact that having a second child exponentially increases the amount of laundry, and that I’m lucky if I make it five minutes picking up toys or standing at the sink before I have to sit down. Also, the baby nurses a lot, and seems to only be happy in my arms. Fortunately, I’m a very good delegator, and I no longer have to wait for the weekend to have time to get the house cleaned up. That whole cooking thing doesn’t really happen either. First of all, I’ve never really liked cooking. I mean, it takes an hour or two to make, twenty minutes for everyone to eat, and another hour to clean up. Total waste of time if you ask me. If I enjoyed it (or could get my husband or kid in on the fun), that would be one thing, but I don’t. Cooking is also very painful for me. It really hurts my back, legs, and hips to be on my feet that long. I’ve tried using a stool, but that doesn’t really work because you have to be back and forth from the stove to the counter to the sink. If only my wheelchair had a hydraulic lift (any inventors out there?). Also, I’m kind of hypoglycemic, and when I’m hungry, I’m hungry now. It punches me in the stomach with no warning, and I’m cranky and impatient and desperate. I do NOT want to spend 5 minutes, much less an hour, making an actual meal. Also, it seems that every day there is a doctor appointment or a haircut appointment, or grocery shopping, or errands, or visiting a family member, or a birthday party, or something or other. Despite my efforts to plan meal times around these events, it just doesn’t happen. I should point out the fact that if I wasn’t married to a Hispanic guy who’s big on real meals, I would probably live on cereal and PB&J. Sal works nights, and I’m not going to cook a big meal for myself and an 8 year old who’s not gonna eat it anyway, so if I were going to make a meal, I would make it during the day when Sal could help me and eat it with me. Well, all of the afore mentioned events happen during the day, late-morning, because I can’t get around in the morning and he has to be back home early afternoon to get ready and go to work. I’m barely off the couch and around in time to get ready to go, much less cook something and eat it. Since he works late, he sleeps late, so the same is true for him. We have coffee and a little something for breakfast like muffins or bagels. By the time we’re done with whatever errand we had, we’re starving, so we hit a restaurant. Admittedly, we eat out way too often, which bugs me because I don’t like wasting money, but I can only do the best I can. Sal does not share my convictions about money. As for the rest of those goals: Romi’s snack I usually start preparing when she gets home. And by prepare, I mean get out some crackers and make some chocolate milk. Maybe wash some grapes. Sometimes she has to get it herself. There are not as many opportunities, as it turns out, to help out in class in second grade as there are in Kindergarten or first grade. They’re older and there aren’t as many party days. Luckily for me she has a great teacher who doesn’t mind if I, and even the rest of the family, come to ‘help’ any day we like. I’ve only made it into the classroom a handful of times, but I love that I am able to do it. Random Acts of Kindness have so far only consisted of the occasional batch of brownies for a friend or family member, just because. Playing the keyboard and working on my DJ skills? Well, between diaper changing, nursing, baths, and him crying every time I put him down, I haven’t worked on that a whole lot either. As we speak, the spots of nail polish left on my nails will continue to dwindle until I have the discipline to use the acetone. The book writing was something I worked on the days that I couldn’t walk at all, but that doesn’t happen as often now that I’m not working. When I stop writing for a few days, I lose the train of thought I had when I left off, so it’s hard to get back in to. 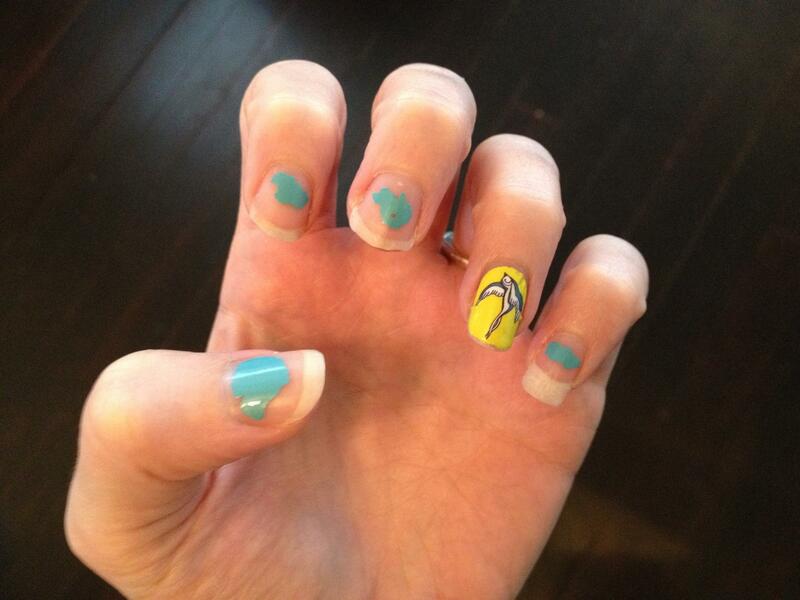 And I thought not working would mean having time for manicures. I realized it was now or never. Either I had to take the risk and get it going, one step at a time; or my worst nightmare was going to come true: I would spend my whole life doing nothing. Not making an impact on anyone or anything. Sitting in front of T.V. and magazines, living vicariously through my children, no excitement or adventure of my own. That is not where I want to be. I want an amazing life. I want to do amazing things. And I would never get there if I didn’t push my fears aside and take the first step. Remember when I said my disability only bothered me when it affected my children? 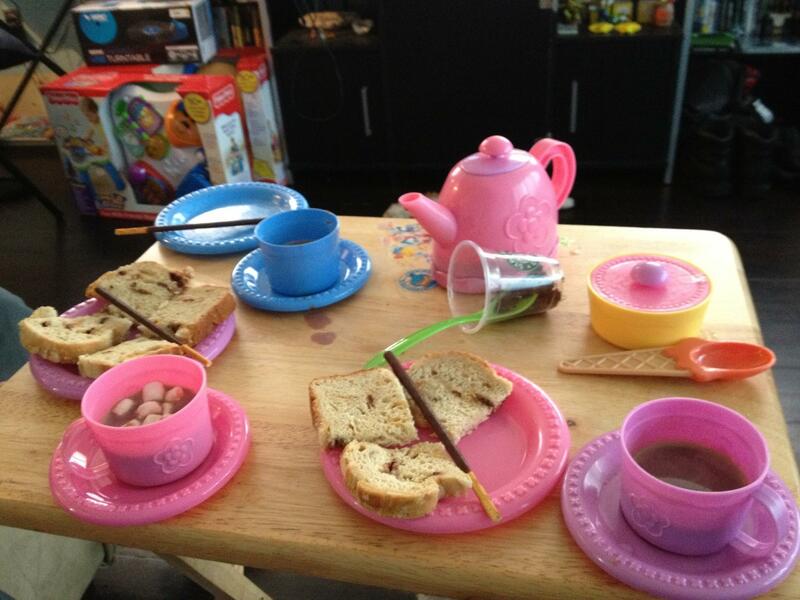 On Saturday mornings, my daughter, Promise (who prefers the nickname Romi), loves to have tea parties. She breaks out her plastic tea set or the glass Dora one she got from our friend Kate one Christmas, and we have tea (chocolate milk) and cake or cookies. We haven’t done this since before her little brother, Cruz, was born; as she pointed out this past Saturday. “Can we pleeeeease have a tea party mama?” She begs using puppy dog eyes, and she knows she’s doing it. I say yes and tell her to go get the dishes she wants to use so I can wash them. Anyone that’s spent a significant time around my daughter can tell you that while she has more spunky personality than any kid you’ve ever met, she is also very detailed, and likes to think out and talk out everything she does. So it takes her a good ten minutes to get the dishes, because she has to decide whether to use the Dora set or the plastic set, what color of cup I should have and what color she should have, and whether the plates should match the cups or be mismatched. While she’s doing this, Cruz is getting louder and louder in his protesting, because he is no longer content sitting on my lap. Or playing with a toy. Or being held to my chest. Or lying down. The minutes pass and seem to quadruple in length as it gets harder and harder for me to hold him while he pushes and pulls. Promise plays with the baby (or at least restrains him) while I wash out the dishes. This takes a while because the tea pot had been use to wash paint off of brushes, and the other dishes were sticky. I stand at the sink bent over, using my elbows to support me, trying to relieve some of the pressure and pain from my back, hips, and legs. I force a smile at Romi and ask if she can feed the baby while I get all the ingredients (she’s decided she wants hot cocoa tea instead of chocolate milk tea). “Can I get the ingredients and make the tea mama?” “Sure, I’ll feed Cruzy.” I love this idea, because I can sit down, feed the baby, and give her the directions, and she’s happy to make the tea. “Want me to bring in the high chair mama?” “No, I’ll just set him on my lap and feed him quickly while you make the tea.” forgetting that she doesn’t usually do things ‘quickly’. I take a deep breath and clutch the baby in one arm, using the other to get baby peaches, oatmeal, and a spoon. With him crying and trying to escape I manage to stir the oatmeal into the peaches. I get the first bite into his mouth and he is happy. I remind Promise how to make the hot cocoa. She spills and splashes while Cruz helps with his spoon and smears baby food all over himself and me. I try to ignore the feeling that the bench is trying to imbed itself into my pelvic bone. By the time I’m done feeding Cruz, Promise has finished making part of a cup of hot cocoa, and I realized that it in fact would have been faster to use the high chair. I would have avoided having to wipe him off top to bottom and change his clothes. “Can I have marshmallows and whipped cream?” She begs. I feel a wave of frustration and I want to snap. I do a quick self-check and realize that my growing impatience is because of my pain, which I can now feel radiating through my arms and into my hands. This is a sensation that I can’t quite explain. It’s not that my arms or hands hurt, but it makes my arms want to writhe. It’s a reminder that I’m in a lot of pain – pain that I’m ignoring and trying to block out. Taking slow breaths I ask her to watch her brother, and I go take some medicine. It doesn’t help the pain immediately, but I feel relieved knowing it will be better soon. I pause for a moment. This would mean doing the whole process all over again. Making more ‘tea’. Toasting and slicing more bread. Realistically, I know Sal doesn’t really like hot cocoa. He’d probably rather keep sleeping since he works late hours. Finally I decided we should at least ask, instead of me making the decision for him. Family time is important since he leaves for work shortly after Romi gets home from school. She asks him and he says yes. I ask her to hang out with her brother while I get daddy’s tea ready. Finally we are all on the couch together, enjoying some very good ‘tea and cookies’, and laughing at our favorite TV show. With a pillow behind my back and another under my knees, the pain is starting to lessen. I smile at it all and I know it was worth it. This might seem like kind of a sad story, but to me it is happy. It is progress. My back started bothering me a lot when Promise was about two years old. Somehow I wasn’t aware of the pain until I was in tears. I think part of the problem was that when I would go to doctors about it, they would brush me off and say that it’s just stress or I just needed to work on my abs. I was convinced it had to do with my CP, but they didn’t want to talk about that. Finally I found a doctor who took me seriously. Unfortunately there wasn’t a good permanent solution, but he helped me by getting me to therapists and AFO specialists, and prescribing medicines to ease the pain. After taking medicine and not being in so much pain, I was able to better recognize when I was in pain, and that being in pain made me very impatient, because I was always in a hurry to sit down. I started to realize that I had been pretty impatient with Romi for the past few years, and I was determined to fix that problem. So while it’s true that I am in pain, I thank God every day that I have the medicine and therapeutic techniques to help it not rule my life. I thank God that it is only pain and not a deadly disease. I thank God for wonderful little moments like this, in everyday life, that we tend to take for granted. And I thank God for the reminders to not take them for granted. I was talking to my friend Kate the other day, and she was telling me how a few days before, when she pulled into her friend’s apartment complex, someone was parked in the handicap space. The car did not have handicap plates, nor did it have a placard hanging in the window. There were plenty of empty regular parking spaces around, including the one right next to the car, so Kate parked there. We encounter this sort of thing all the time. 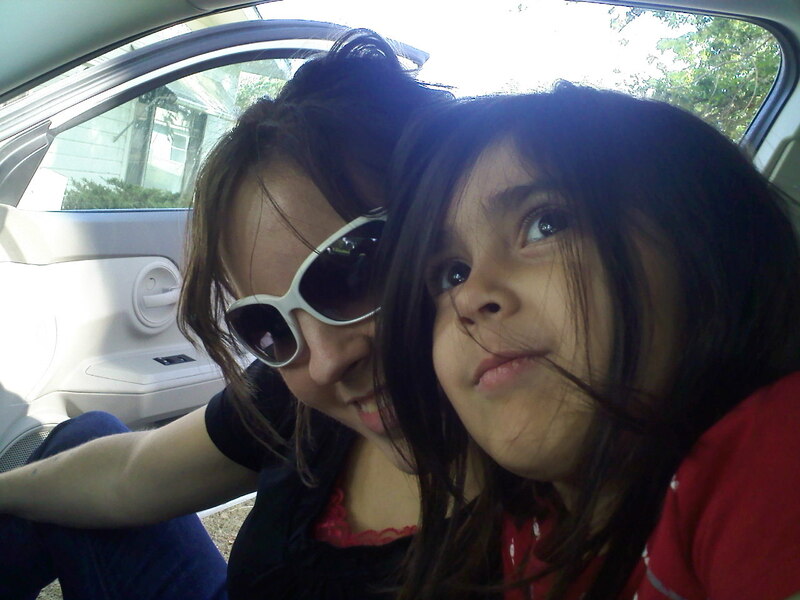 Every time I would go to pick up my daughter from school, there were cars parked in the handicap spots that did not have handicap placards or plates. After a few times of watching them leave their other kids in the car to go get the one coming out of school, it was pretty obvious that they didn’t just forget to hang the placard. Despite the schools population of about 500 kids, the school parking lot is tiny. 20 spaces tops. So all the spaces were taken. Some might find this a valid reason for them to park in the handicap spots. Let me explain why it’s not. It’s against the law. Plain and simple. Interestingly, when a police car is parked near the school parking lot, non-handicap vehicles do not park in the handicap spaces. By parking there, they are saving themselves the inconvenience of parking at the curb farther away. Which means a handicap person (such as I) who needs the spot has to park at a curb farther away. It is very difficult for a handicap person to walk that far (especially while carrying a baby). That’s why they have handicap spaces. Sure some, like me, have a wheelchair. Have you ever tried to wheel a wheelchair up hill and over curbs? Not easy. I ended up going to the school office and asking if they could do something to try to ensure that non-handicap cars didn’t park there. They were very helpful and said they too had noticed the problem and would take care of it. One of the cars that parked there no longer does. Another, however, and decided that parking in the white lines between the spaces is a good alternative. This is also a bad idea, because someone that needed to use a wheelchair or had trouble stepping up the curb, would not be able to get to the sidewalk. Another thing we see a lot is people that decide it’s okay to park there if you’re just letting someone else run in and you’re going to stay in the car and keep it running. Newsflash: This is still taking up the space. When a handicap person comes along, they still cannot park there because your car is there. And if we’re being honest with ourselves, probably the only reason you would need to stay in and keep the car running is so you can quickly pull out should you see a police officer. To my readers, please remember not to take up the handicap spaces if you are not handicap, or the lined spaces next to them. Instead, thank God for your ability to walk from that parking space that seems like it’s at the other end of the world, and see it as an opportunity to get some exercise. There is another side of the problem of handicap parking: The fact that while I’m sitting in a car, I do not ‘appear’ to be handicap. Why is this a problem? Well, to me it’s not. But to the many people who glare at me as I pull into a handicap space, apparently it is. Since I can remember, even as a child, when our family pulls into the handicap space, passers-by slow down to check the plates, check for a placard (which we haven’t had time to hang yet), and smirk. Sometimes they were satisfied when we hung the placard. Other times they would keep staring and glaring until the saw the leg braces or the limping. Normally, your staring and smirking and double checking my plates as I pull into the handicap space would provoke me to quickly get out of the car, start walking, and smile at you in that kill-em-with-kindness sort of way. However, today has not been my day, so it looks like it’s not going to be yours either. The fact that I am young and thin and wear makeup has nothing to do with why I’m parking in this space, but way to judge a book by its cover. You have your parking spot, so I really don’t know what you are so concerned about. And to the gentleman who when I was here earlier pointed out that I ‘appear’ to be a good mother despite my obviously crooked legs, thank you, I really needed your affirmation; and you’re right, there is no way to say that without being rude. Ok, so it wasn’t my best day temper wise. Next time I’ll take a deep breath and count to ten. There was a time when I felt like I was in the wrong. A time when I felt like I needed to quickly jump out of the car and parade myself around because I owed them an explanation. I no longer feel that way. While I know how frustrating it is to have a handicap space taken by someone who doesn’t need it, while I am forced to park at the other end of the parking lot, I also realize that handicap does not have a ‘look’. That handicap spaces are not only for the elderly or obese. That the owner of the vehicle may have simply forgotten to hang the placard. In fact, as many times as I forgot to hang mine, I’m still kind of in shock that I never got a ticket. So, friends, the lesson here is that the ability to walk across a parking lot is not over-rated; and never judge a book by its cover. Handicap does not have a ‘look’.